The Graduate Management Admission Test (GMAT) is the world’s most renowned management exams. Conducted multiple times every year, GMAT scores are accepted in nearly all top B-schools in the world, including India. Its acceptability across all borders underlines its comprehensive nature. 2,100 universities offering over 6000 programmes accept GMAT scores during their respective admission process. 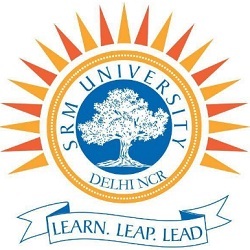 Conducted by Graduate Management Admission Council (GMAC), GMAT is predicated upon assessing standard mathematical abilities in data sufficiency and logical and critical reason. Besides mathematical skills, candidates’ language skills are also tested. Sections such as analytical writing, verbal and reading skills are also a part of GMAT. The full syllabus is listed below. Topics in mathematics are generally basic concepts and candidates are expected to be well versed with such topics. This section is essentially a 30 minutes essay based upon a random topic. The essay is graded on a 6 point scale, six being the highest grade and zero being the lowest. The score is calculated by taking the average of two scores. One score is generated by an automatic essay grading software and the other by an examiner at GMAC. The average of these two scores determines the writing score of a given candidate. Integrated reasoning was introduced as a section in GMAT back in 2012. The main purpose of this section is to gauge the ability of a candidate to assess data from differing sources. The section comprises of 12 questions with sub-questions in most of them. The score in IR section is given on a scale of 1-8. This section like AWA is calculated separately from the verbal and quantitative sections. The types of questions asked in IR are from graphics representation, two-part analysis, multi-source reasoning and table analysis. One of the most important sections of the GMAT exam due to its longer course requirements, Quantitative Aptitude aims to test a candidate’s general mathematical skills. From the syllabus mentioned above, one can gauge the expansiveness of the syllabus. Questions are primarily of two types, data sufficiency and problem-solving. Scores in this section range from 0-60, but GMAC only releases scores between 6 & 51. Every GMAT preparation success is premised on a strong showing in the verbal section. The questions here are of three types: reading comprehension, sentence correction, and critical reasoning. The unpredictability of this section is well documented. Reading comprehension, from being one or two paragraphs long can jump up to anywhere between six and seven at times. Time management is the key for any high profile exam and GMAT is no exception. The verbal scores are devised between 0-60, but GMAC reports scores between 9 & 44 only. GMAT is conducted in a computer-based format only. 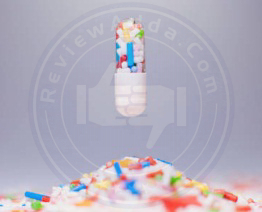 The unique aspect of the exam itself is the sifting difficulty level which increases as the test progresses. This means the difficulty of the coming question depends on the result of the previous question. If the previous question is answered correctly, the difficulty of the next question is a level higher, otherwise lower. This cycle plays a vital role in determining the final GMAT score. A candidate who is able to reach a higher level during the course of the exam correspondingly scores higher in GMAT. This unique approach to each candidate’s aptitude sets GMAT apart from other standard exams which do not incorporate such a policy while setting the exam pattern. This is the reason why GMAT cutoffs do not seem as daunting as CAT cutoffs for admissions to B-schools in India. Due to a lack of division between questions, CAT cutoffs usually have to be set much higher. Admission to foreign B-schools such as Wharton or Harvard is possible with a percentile of 90%, highlighting the fallacy of our usual admissions procedure. Entrance exams such as JEE, CAT, CSE, and NEET should take a leaf out of GMAT’s blueprint and offer admissions not based upon raw scores, but the level a student has reached in an exam by stepwise growth. The time for the four sections is allotted as follows. The various details regarding GMAT registration, exam date, and fee are tabulated below. GMAT scores are usually calculated between 200 and 800. This score is essentially a scaled score. Raw scores are simply the marks from correct answers from the quantitative and verbal section. The raw score lies from 0 to 60. This raw score is scaled to a higher score based on parameters known only to GMAC. Analytical writing and integrated reasoning scores are calculated separately and not included in the scaled scores. Coming to the underlying question, a good GMAT score is subjective to the candidate’s goals. The average GMAT score this year is 551.94. However, some of the top business schools in the world such as Harvard, Yale, Chicago, and NYU have average GMAT score as high as 725. If joining a top B-school is someone’s goal, a score of 720 is necessary. Many top B-schools in the world such as Stanford, Harvard, Columbia etc have started to accept GRE scores. This has brought B-school aspirants on the crossroads once again. GMAT or GRE? Both exams are different in many aspects. While GRE is a more comprehensive exam covering all postgraduate programmes and not only management, GMAT is a much more focused exam. The question is which one is a better choice? For someone who is weak in mathematics, GRE is a much better option. GMAT quants are notorious for their complexity. Since scoring high in quants is necessary to make it to top B-schools, students with weaknesses in mathematics should choose GRE. Regarding the need for high scores, GRE is as unforgiving as GMAT. Candidates are expected to score at least 320 to have a shot at the top B-schools. So, besides mathematics, there is generally no disparity in terms of difficulty. AWA and IR score: What is the point? Many applicants are puzzled at the significance of the scores obtained in AWA and IR section. Often students ignore these sections because of their relatively lower importance. However, one should not confuse low importance with none at all. 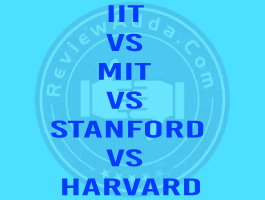 While a very high score in AWA and IR section won’t matter much, a very low score may ruin your chances of making it to Harvard of Stanford. Every year, a group of students with an incredible GMAT score misses out on the top B-schools due to a below average score in AWA and IR section. Thus, while it may not be necessary to ace these two sections, getting a respectable grade point is of utmost importance. The prize after every endeavor full of toil and struggle is sweet. 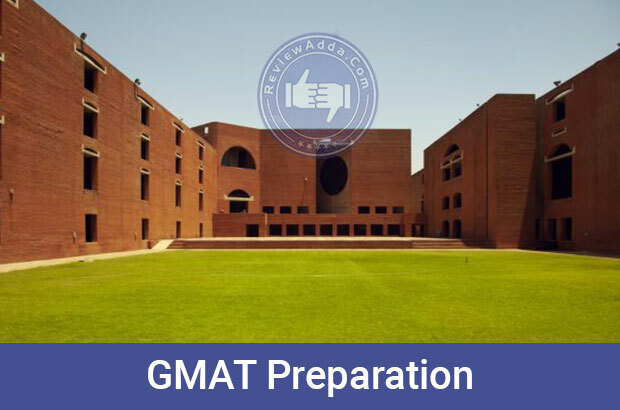 GMAT preparation is something borne from a similar ilk. A worldwide exam written by nearly 200,000 people proves there is nothing easy about GMAT preparation. But how does one go about it? The number of people offering advice on MBA preparation is monumental as well. To sieve through all the garbage and concentrate on the job is a difficult task in itself. This is no longer a problem. Selecting from the pile of advice, the tips which would be crucial for your GMAT preparation are listed below. Making it to the top B-schools of the world is a dream of every aspirant during GMAT preparation. And as every dreamer is scoffed upon by friends, acquaintances and even family (yes, this happens), you will feel the pile of pressure lowering your shoulders. The only way to avoid this malaise during GMAT preparation is to shot out the negativity. You cannot control what others think, but you can be a master of your personal environment. There will be many times when you will doubt yourself and your abilities. At times such as those, the last thing you’ll need is negativity and pessimism pulling you down. Thus, creating a positive and optimistic vibe around your GMAT preparation cycle is essential to success. GMAT is not JEE Mains. Many candidates in a rush of excitement start GMAT preparation 10-12 months before taking the exam. This is a futile exam. Experienced teachers and experts will tell you GMAT preparation requires nothing more than six months of complete devotion. The problem with starting early is running out of fuel in the final days of GMAT preparation. GMAT preparation is a marathon. And like all marathons, the ones who conserve their energy, in the beginning, emerge victorious at the end. GMAT preparation should be borne of a similar strategy. The ideal time to commence GMAT preparation is anywhere between 4-7 months. This time varies subject to the varying pace of learning of different people. Sometimes GMAT aspirants expect too much of themselves. The act to constantly over emphasize weaknesses is one of the mistakes many first time GMAT applicants make. The key to studying for GMAT lies in balancing the strong and the weak sections. To paraphrase, your strong sections should be bulletproof. No questions should seem alien or insurmountable. At the same time, your weaker section should be strong. Nobody answers all questions correctly in the exam (well, some do). The key, thus, to attain a strong GMAT score is to maintain a coherent balance in tempering your strengths and weaknesses. Jumping on a bandwagon has never rewarded anyone and it won’t reward you either. GMAT preparation is often damaged by the dependence of students on coaching classes. There is no bout over the windfalls of attending coaching classes. The spirit of competitiveness inculcated in coaching centres does provide an edge to your GMAT preparation process. 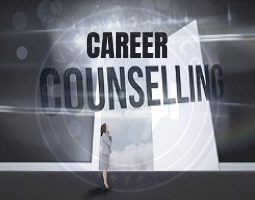 However, it is vital not to be swayed by the effect of coaching centres. While preparing for a standardized exam given by over 2 lakh people every year, there is no substitute for self-study. Whether it’s burning the midnight lamp or hitting the books early in the morning, studying solitarily is one of the key elements of a successful GMAT preparation cycle. Avoid being the book seller’s favorite customer. Many students often remain confused about which books to buy and the material they should be following. You might fall into the same trap as well. Remember, burying yourself in a heap of GMAT books will never get you anywhere in GMAT preparation. Consulting multiple sources simultaneously without actually finishing any of them is often the symptom of a confused student. Consult a set of GMAT books advised by your friends, teachers or colleagues and stick to them for GMAT preparation. This will add a certain level of cohesion to your preparation and help in uniform preparation across all subjects. The average score at which Harvard’s intake for business programmes begins is 729 out of a possible 800. The statistic above should make you well aware of the task which lies in front of you. No section of the GMAT syllabus in unimportant or non-consequential. The intense competition every year literally guarantees every section ignored to be one of the nails in the coffin of your GMAT preparation hopes. It is absolutely vital to know every section and have a clear idea about how to solve questions from that particular section. Even one correct answer could scale you higher than 100 students. Why not use this opportunity and hone your entire skill set? Solving questions can sometimes be like being stuck in traffic. You always wish you knew a different route. To take your GMAT preparation to the next level, it is beneficial to have an alternative method of solving a question. In the heat of exam day jitters, there is always a possibility of you losing your way while solving a question you have done ten times before. At times such as those, having an extra method to bail you out is an exceptional tool to have. The land of the unknown isn’t a place worth visiting. GMAT is a very serious examination. Often under pressure from family or friends, people tend to apply and start GMAT preparation. This is a vicious exercise and needs to be stopped. The corporate world is filled with young professionals who regret choosing the field they ended up working in. There is no dearth of people in the world who made the wrong choice knowingly and willingly. You should not be a statistic in this pile. If doing an MBA and working as a business professional isn’t your cup of tea, change course. Monetary benefits will only satisfy you for a few years until the time comes when you’ll start regretting the choice you made all those years ago. One great reason for dampened spirits amongst students during GMAT preparation is the failure to achieve previously set targets. The fact that this mistake can be avoided easily is all the more frustrating. Look at the calendar and set targets knowing your capabilities to the letter. Additionally, build caveats in case you miss a day of study due to some reason. While appearing an exam such as GMAT, there should be no room for pessimism to creep in. GMAT preparation isn’t life and death and MBA is just another course. Many students prepare hard and prepare well. However, forgetting the world outside and locking yourself inside the room for hours upon hours is a strategy bound to implode. Maintain contact with the world outside, talk to friends and family, and remain updated with current affairs. Perhaps the greatest mistake you can make during GMAT preparation. Despite all the effort, sometimes it may still not be enough. What could be the reason? How much work is truly enough? The greatest problem with working hard blindly with no direction is ending up empty-handed for all the efforts. Many GMAT preparation plans are thrown out of the window due to aspirants ignoring structure and planning for dogged hard work. The solution to this problem is simple. Analyse mistakes you’re making repeatedly, avoid topics you’ve covered thoroughly and always try and solve new types of questions. The GMAT exam can throw up a plethora of questions. Attempting questions of a different mould from time to time hones a candidate’s GMAT preparation very well. Naivety has no place in GMAT preparation. Often college students fool themselves into believing they can ace multiple exams at the same time. In some cases, some students do clear two or three exams together. However, in an ideal scenario, there should only be one exam in your crosshairs. 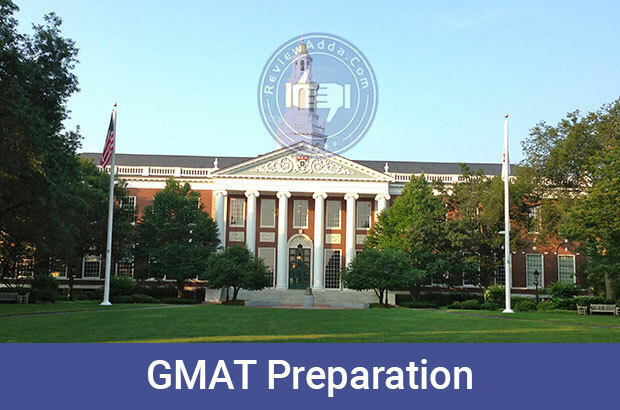 GMAT preparation unlike other exams preparations like CAT and MAT has a more potent focus on the verbal section. Fundamentally, both exams do promise a similar future as both are gateways to B-schools. Students though should focus only on one exam during preparation. One of the most underrated qualities a student possesses, planning is pivotal to building a strong foundation for your GMAT preparation. In a four-month long cycle, it is vital to divide days, weeks and months into specific modules allotted to different subjects. At the same time, the plan implemented for GMAT preparation needs to be executed with utmost discipline. While certain changes can be made from time to time to accommodate extra hours and missed targets, but the fundamental core of the plan should be sound. Not only does a plan organize your schedule, it creates a fundamental pathway to where you want to be in four months time. This may seem a usual tip which many students follow anyways, that isn’t always the case. The problem with this tip though is that most students attempt GMAT practice tests half-heartedly. The proper way of attempting mock exams is working by the clock and not losing focus for a period of 210 minutes. The importance of solving GMAT sample tests is largely apparent. The raw experience of sitting in a GMAT exam for a period of 210 minutes should be inculcated in your approach. Solving mock exams is essentially a simulation of D-day. You will get to feel the pressure of solving an exam under the burden of a clock. Not only do solving GMAT mock tests develop speed, it provides a certain level of mental toughness. While cohesively indentifying the mistakes you’re making during GMAT preparation is advisable, it can also be detrimental to be overly critical. GMAT preparation requires a certain level of panache and flair. If you wake up one morning tense and worried over your level of GMAT preparation, it can act as a boost to your studies or become an impediment. Whereas a candidate who is confident about his/her GMAT preparation is much more likely to be positive and calm when faced with adversity. As mentioned in the first tip for GMAT preparation, positivity and optimism are necessary elements of successful GMAT preparation plan. Besides some of the world’s best B-schools, some of India’s top management institutes accept GMAT scores for admissions. Even the IIMs, who refuse to accept students applying through premier Indian exams such as MAT, XAT, and NMAT, accept GMAT scores as worthy indicators of a top draw candidate. Though the list of colleges accepting GMAT scores is very long, the top 10 B-schools in India accepting GMAT scores have been listed below. While most top private B-schools on the list accept GMAT scores unanimously, the IIMs follow a different procedure. Only foreigners living outside India or Indians who have been living abroad for at least two years are offered admission through GMAT. Thus for a student living in India, the only way to an IIM programme remains the CAT exam. Besides this clause, the IIMs also do not offer their mainstream PGDM programme through GMAT. The PGPX programme is essentially a more professional and industry-driven approach than a regular PGDM programme. Only lasting one year, only candidates with work experience of 3-4 years can apply for the PGPX programme. The private B-schools such as IMT, XLRI and SP Jain offer the complete bouquet of courses based on GMAT scores. 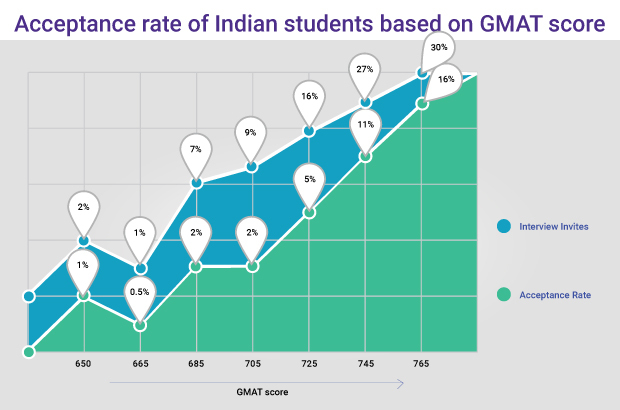 As apparent from the cutoffs mentioned above, to make it to the top B-schools in India through GMAT, a percentile over 90% is necessary to merely be eligible for admissions. As mentioned before, GMAT is the world’s most popular management entrance exam. Besides colleges in the US, premier institutes in Asia such as INSEAD, NUS, and HKUST also accept GMAT scores for admission to various management programmes. The wide acceptance of GMAT across major B-schools in the world has only amplified the demand for a common management exam accepted across the world. 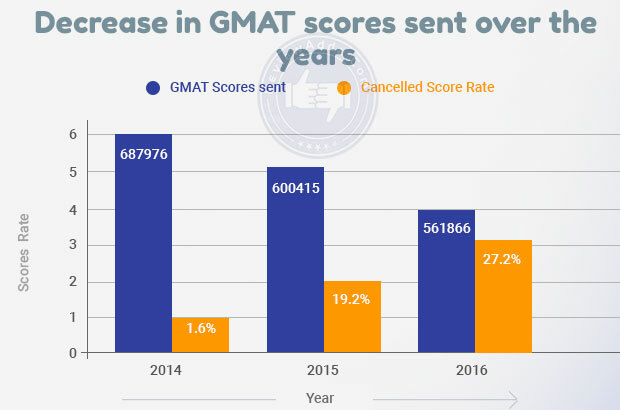 While such a demand might take some time to be met, there is little doubt over the popularity of GMAT itself. 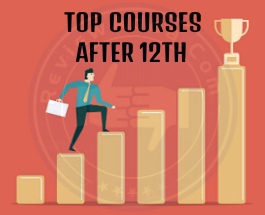 Conducted by GMAC, GMAT is increasing in terms of difficulty and exclusivity every year due to the rising GMAT cutoffs set by B-schools around the world. The top 10 B-schools in the world accepting GMAT scores have been listed below along with their respective GMAT cutoff score. Like many computer based exams, GMAT result is available right after it’s over. However, the score obtained after the exam is known as the unofficial score. The unofficial score is essentially based upon the questions you answered correctly in the quantitative and verbal section. Along with these details, the unofficial score will also carry an authentication code which you’ll need to access your official GMAT score later. The official GMAT score is a scaled total out of 800. This score is based on the level of questions a candidate reaches while giving an exam. This refers to the constant increase in the level of questions when a candidate is attempting GMAT. If a candidate answers one question correctly, the next question will be chosen from a pile of a higher level of questions. If that question is attempted correctly too, the level goes higher once again. The option of retaking the GMAT is also made available to candidates who may not be satisfied with their performance. However, a candidate can only retake GMAT 16 days after the previous attempt. Only some of the students are placed in college placements. Companies like Infosys,hp,hcl,infotech came to our college.It companies where more compared to others.They all offered different salary packages along with training. Some companies offered 10 to 20 k/month.